Working with GWF researchers, Heather Dixon’s work focuses on the biomonitoring of ecosystem health in the NWT. Dixon received her PhD from the University of Waterloo, where she investigated Atlantic salmon marine feeding using stable isotopes and gut contents analyses. 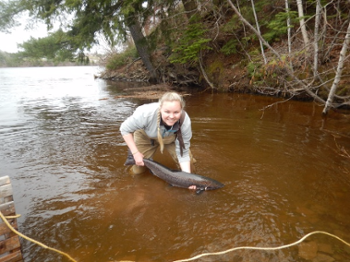 Prior to joining Laurier, she worked at the Atlantic Salmon Federation, researching Atlantic salmon survival during their migration to the ocean using acoustic telemetry. As the research associate, biomonitoring, Dixon’s work will focus on the biomonitoring of ecosystem health in the NWT involving investigations of the responses of diverse biota to environmental changes and resource development.